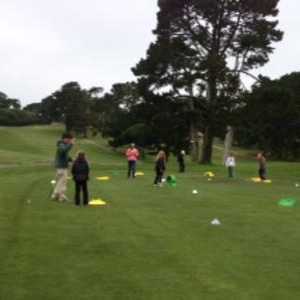 SAN FRANCISCO -- It's not often you find tourists without clubs, or any interest in golf for that matter, gawking in the middle of a course. 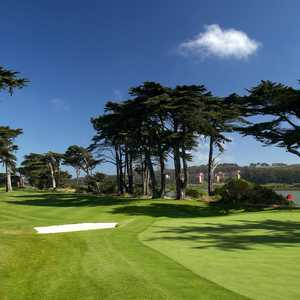 Lincoln Park Golf Course in the heart of San Francisco is not your ordinary course however. A view of the Golden Gate Bridge from near the fifth green at Lincoln Park Golf Course. This city-owned, dirt-cheap track is pure muni in course conditions and magnificent resort worthy in views. Hence, the tourists with camcorders who couldn't tell the difference between a 3-wood and a nine-iron if given three tries. Located in the middle of a public park that includes the Legion of Honor, Lincoln Park is open for anyone to stroll through. The first time you'll encounter the gawking brigade is on the long trek between the second and third holes. Here, there is a clear, uninterrupted view of the Golden Gate Bridge in all its glory. Expect to be waved down in your golf cart and asked to snap someone's souvenir photo. Lincoln Park is one of those courses that's all about soaking up the atmosphere. You'll probably be cursing the maintenance staff the first time you lose a well-hit ball among all the white dandelions growing unbothered in the middle of the many fairways. This is a true muni (it may be an assumption to think a maintenance crew even exists). But any ill will over this should evaporate once you recall the modest greens fees. This is such an unbelievable bargain for San Francisco, city veterans may be tempted to hug the college kid behind the counter in gratitude. Spend any time in this city by the bay and you almost start expecting to be hit with a $10 city air tax every time you sneeze. Lincoln Park isn't just special because of its San Francisco treat price. Halfway through the round, I found myself wishing I had this kind of course down the street from me. It's not just the views which border on truly spectacular. It's the actual golf too. This short, little par 68 actually presents a variety of challenges and different looks. "I liked it more than I thought I would when I first got here," Chicago golfer Han Wuirdo said. "I didn't like what it did to my score, but I liked it." "I didn't think it was that hard," Wuirdo's buddy Jeff Clarke broke in. Lincoln Park isn't hard as much as it's interesting. While it's true it measures only 5,146 yards from the back tees and has only one 500-yard par 5, it compensates for that distance impotence with narrow fairways. You'll never hear "Fore!" as often or take it as seriously as you do here. Balls fly from one fairway to the next. The combination of a cheap course, a liberal bring-your-own-beer policy and plenty of inexperienced golfers adds up to a number of covered-head ducks. The state of your reflexes and your mood largely determines how you react to this situation. Our group had to avoid one screaming Pro V1 that came from two fairways over. The guy who hit it was either too embarrassed or too lost to come over and retrieve. "Nice ball too," the guy who flinched as it whizzed over his shoulder muttered. Not that this is the strangest sight you're going to see at Lincoln Park. Not even by a longshot. That would have to be the middle-aged man who wandered onto the course with one club and started hitting shots up the wrong side of the fairways, from greens to tees. He mostly did this on empty holes. Told you the atmosphere at Lincoln Park is a little different. Late in the day, people start venturing out onto the course (no sneaking needed) and playing on open holes. Forget paying twilight rates, it's open twilight season. It isn't just crazed, one-club, middle-aged men doing it either. A dad teaching his daughter the game came out on this afternoon, along with the expected assortment of college guys and never-interested-in-college guys who hadn't seen sober in a long time. It's actually a refreshing, almost bohemian scene, as long as you're not one of those rigid, stickler for the rules types. The encouraged walking, lugging your own bag policy, adds to the communal feel. No one bugs anyone else. The people getting in a few holes for free respect the rights of the golfers who actually put down their 20 to 30 bucks. And forget about anyone from the clubhouse hassling the freebies. Once you've left the first tee, you're essentially a NASA astronaut. You're in your own orbit, with home base a long way away. There's plenty along the trip to make you never want to go back. 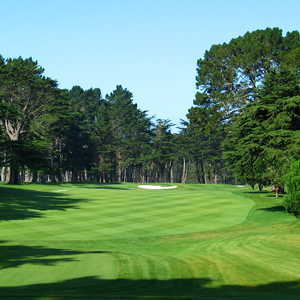 The back nine is particularly interesting, incorporating many of the hilly up and downs you expect in San Francisco. This stretch actually starts with No. 9, a straight uphill approach that can make you feel you're swinging in the middle of nowhere with the ocean waves crashing in the background and the white dandelions flapping in the breeze. Then, there's No. 13, a straight downhill that's all fun (and widely misjudged shots flying over the green). Lincoln Park Golf Course's 17th -- a 240-yard, par 3 -- is the clear, undisputed scene stealer though. Set up on a ridge along cliff's edge, this hole offers the best view of the Golden Gate yet, not to mention the tugboats and sailing ships gliding into the sunset. The cliff drops straight off on a plunge with only a two-foot wire fence separating golfers from the highway running along the ocean below. This isn't a spectacular muni hole, it's a spectacular hole period. The dandelions even disappear here. Now you really wish you could call this course home. At Lincoln Park Golf Course, golfers look at the scenery all around the course, rather than the course itself. And that's a good thing. You're going to be blown away by the views here, unimpressed by the conditions. But you know what, who cares? Play it anyway. It's $30 more than well spent. This is the course to play when you're stuck in the heart of the city on a business trip and can't take the time to drive a half hour or more. This is the course to play when you're with some beginner golfers who love the game better than they can play it. This is a course to play period. It's joyful golf devoid of any pretension. The lack of distance doesn't bother as much as you first think it will. When's the last time you played a truly captivating par 5 anyway? Twelve par 4s, five par 3s and one par 5 isn't such a bad combination after all. There are no beer cart girls zooming around the course, but there is a good-looking beef tip sandwich girl camped out in an informal, open-air setup right outside the cramped pro shop. There are no bathrooms out on the course either, so it's best to go before you tee off or be prepared to commune with Mother Nature. Bare minimum golf never seemed so fun.